Our friends from the Festival of Spirituality and Peace team will have a stand under at St John's Church, Edinburgh (corner of Princes Street and Lothian Road) on Friday 25th January 2013, handing out porridge to anyone who cares to stop and have a chat. They will be there from 8am to 12pm or whenever the porridge runs out. 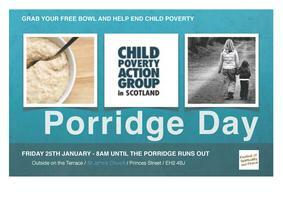 Following the success of their last porridge stall we have chosen to support the local charity Child Poverty Action Group in Scotland (CPAG). One in four of Scotland’s children are officially recognised as living in poverty. In some areas over one in three children grow up in poverty. With Scotland’s undoubted wealth CPAG believes this is a scandal. There is no reason why our child poverty rates should be so much higher than in many other European countries. Poverty remains one of the most serious problems facing children today. Its effects last a lifetime, negatively impacting on health, education, social and physical development and seriously harming future life chances and opportunities. CPAG in Scotland was established in 1999 and works to raise awareness of the devastating impact poverty has on children in Scotland, maximise families’ incomes by helping to ensure those eligible for benefits and tax credits receive their full entitlements and campaign for positive policy changes to end that poverty. You can sign up to let them know you're coming at Eventbrite.